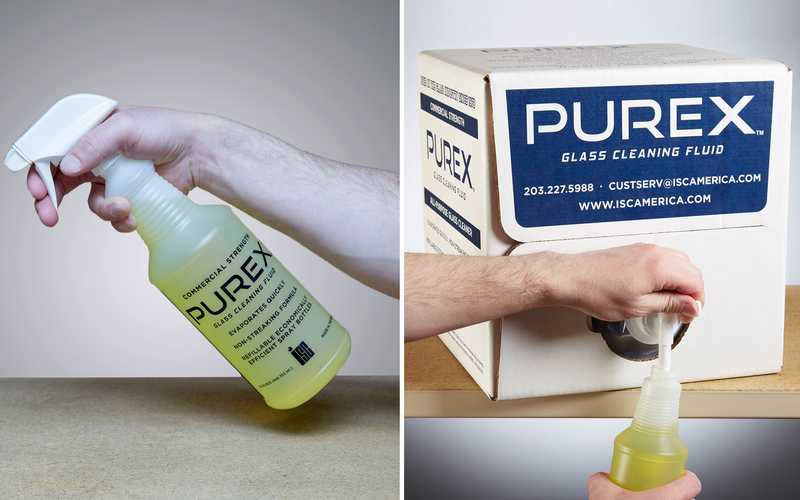 PUREX™ Glass Cleaning Fluid is the perfect solution for a no streak, cost efficient glass cleaner that has been used in the glass industry since 1979. PUREX is purchased in bulk and uses refillable spray bottles which brings significant cost efficiency and is better for the environment. One five-gallon Bag-in-a-Box is equivalent to 50 aerosol cans and the PUREX packaging is more efficient than cans because you use 100% of the material. PUREX will also save time with rapid evaporation and uses less paper towels when cleaning with the competitors’ products. The formula is made with no ammonia or vinegar for a low odor clean up and is proudly made in the USA.